Tension headaches are the most common type of headache since stress and tension are the main variables causing them. While tension headaches don't cause sensitivity to light, nausea, or vomiting, they do cause a constant ache which usually affects both sides of the head. Migraines are another common headache to affect people worldwide. Unlike the tension headache, however, pain felt from a migraine is usually localized to one side of the head and is often accompanied with nausea, vomiting, and a sensitivity to light and sound. Both headaches can be caused by stress, posture, metabolic changes, hormones, allergies, or muscle spasms. Many people suffer tension or migraine headaches caused from a spasm of the suboccipital muscle and trigger points. A group of four muscles, the suboccipital muscles are located on each side of the back of the neck, just below the occipital bone, or the base of the skull. These muscles attach the head to the top two vertebrae of the neck. The suboccipital muscles control the turning and tilting of the head from side to side. There are many different reasons that cause pain to radiate within the suboccipital muscles which can then cause a tension or migraine headache. Pain can begin from frequent moving of the head, using the shoulder to hold the phone to the ear, propping the head up in the hand and looking to the side, or emotional tension. When the suboccipital muscles are in spasms, it can aggravate the greater suboccipital nerve resulting in a series of events that produce tension headaches. Trigger points are essentially knots in the muscles of the neck which can cause a lot of pain. While the knots themselves don't hurt, the pain is referred to other areas. The most common trigger point for headaches are within the suboccipital muscles. Tension within the suboccipital muscle trigger points will refer pain from the back of the head to the eye. Often, it is described as a headband of pain, with a deep ache radiating from the back of the head, around the ears, all the way to the back of the eyes. 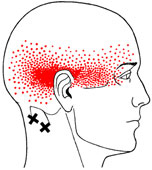 Rubbing the trigger point muscles may provide some relief from the pain and reduce the headache intensity or sensation. However, rubbing these trigger points can also cause the headache pain to increase. The goals of physical therapy for trigger point headaches are to normalize the musculoskeletal system as much as possible in order to reduce tension and stress on joints and soft tissues. It involves decreasing muscle spasms, decreasing pain, and improving flexibility. Posture, alignment, and strength issues will also be addressed because faulty mechanics within the muscles can contribute to the development of trigger points. Physical therapy treatments can include the use of heat or ice, soft tissue mobilization, cervical traction, muscular releases and muscle energy techniques. Alternating ice and heat can decrease pain, headaches, muscle spasms, and trigger points. Increasing blood flow and decreasing the muscle spasms are the most important factors in treatment plans. Physical therapy can be combined with massage therapy and the Graston Technique to decrease headaches and trigger point referral pains. Poor posture is associated with suboccipital muscle spasms and headaches. When the head and shoulders are leaning forward the suboccipital muscles compensate to lift the head. Doing this creates tension within the suboccipital muscles, causing them to tighten. Tightening overwhelms the muscles and they begin to spasm. The spasms can lead to small injuries and trigger points. Improving head and neck postures will decrease the stress on suboccipital muscles. To know if your headaches are being caused by poor posture, there is a little exercise you can conduct. Sit up tall, roll your shoulders up and drop them down. Try to push your shoulders toward the ground. If you notice that you were slouching and your shoulders dropped a considerable amount, you have poor posture which may mean that that is the cause of your tension or migraine headaches. Combining physical and massage therapy with improved posture reduces the chances of a tension or migraine headache occurring. Incorporating massage therapy into physical therapy quickly decreases the intensity and frequency of tension headaches. Massage therapy used on a regular basis is a great treatment for helping the whole body maintain a level of relaxation and stress-relief. This relaxes the muscle spasms and trigger points, therefore significantly reducing the chances of tension and migraine headaches. Massage therapy also eases the pressure brought on during a tension or migraine headache. The therapy focuses on the head, neck, and shoulders to decrease the pain and discomfort associated with headaches. A trained massage therapist will work to decrease muscle spasms in the suboccipital, trapezius, scalene, SCM, cervical spinal, thoracic paraspinal, and rhomboid muscles. These muscles are all commonly involved in tension and migraine headaches. By removing these contributing factors, the headache intensity decreases at a faster rate than just physical therapy alone. Cervical exercises and stretches are designed to increase range of motion, flexibility, and improve function on the neck joints and muscles. By conducting these stretching exercises recommended by your physical therapist, the suboccipital muscles and trigger points will be stretched and become less prone to causing headaches. Stretches and exercises will also help other surrounding muscles to stretch and strengthen, reducing the chances of headaches. Repeat the exercises several times a day for three sets of 10. The stretches can be held for 10 seconds and then relax for 10 seconds. Repeat the stretches three times each side, several times a day. Rotating the head several degrees will change the intensity and muscle being stretched. Heat can be used before stretching for 15 minutes. Ice can be used after the exercises if you experience soreness. 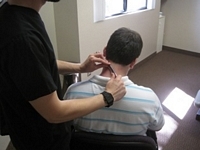 Suboccipital trigger point referrals can be involved in tension and migraine headaches. Physical therapy and chiropractic treatment that reduces the muscle spasms, improves flexibility, increases range of motion, and improves postures can improve suboccipital referral headaches. Our Neck Pain Exercises and Treatment page contains common exercises and stretches for headaches and neck pain. Headache - More information on headache treatments. Graston Technique - Is a treatment for breaking down scar tissue, decrease muscle adhesions or "knots" in muscle. Massage Therapy - And how it can help reduce tension and migraine headaches. Cold Laser - Laser therapy increases blood flow, decreases inflammation, and reduces muscle spasms. It can be very effective in people who just don't get better with traditional treatments.